There is a lot to love about having a heated driveway. You abscond from back breaking snow removal after every single snow storm for the entire time you live with a radiant heated driveway. You should love your radiant heated driveway for that perk alone, but it does so much more. Having a heated driveway allows you to stash your snow shovel, snow blower, salt and deicing products. You don’t have to hire anyone to provide snow removal and you don’t have to do it yourself either. Because of the simple automation of radiant heated driveways there is no longer a worry about using harsh chemicals to keep the ice away. The snow melting system takes the burden of snow removal from you and the harsh products out of your soil and gutters. Installing a heated driveway helps keep the environment clean, by avoiding cruel environmentally toxic products. Radiant heated driveways are wise investment to any new home construction and a valuable resale home improvement project to your lived in and loved in home. But heated driveways also reduce your impact on the environment by eliminating fuel emissions from your snow blowers, trucks with blades, even four-wheelers that push snow. The costs are more minimal that you might imagine as the technology is perfected and the competition more savvy, pushing everyone to improve on the radiant heating cables being used as well as the overall cost to the end users. Shopping snow melting systems during the spring months is smart. Even smarter, shopping a radiant heat solutions provider that meets ASHRAE standards. It’s your ticket to finding the very best electric snow melting system for your home. What is ASHRAE? The American Society of Heating, Refrigerating and Air-Conditioning Engineers (ASHRAE) is an organization committed to advancing the arts and sciences of heating, ventilating, air conditioning and refrigerating to serve humanity and promote a sustainable world. Sounds a bit lofty, huh? Basically, through research and writing, ASHRAE is striving to become the source for technical and educational information, and the primary provider of opportunity for professional growth in the arts and sciences of heating, ventilating, air conditioning and refrigerating. What does this mean to you as a consumer? Snow melting system requirements vary, depending on the location and specifics of the project, such as altitude, average snowfall and temperature, etc.). ASHRAE standards were established to address these variances to optimize system performance for radiant heat. Basically, if you want the best snow melting system, it’s a good idea to choose a radiant heat solutions provider that adheres to ASHRAE Standards. This is where Warmzone comes in. Warmzone designs custom systems in accordance with ASHRAE Standards to ensure they meet the specific needs of each customer. Adhering to these standards means breaking it down regionally―looking at the weather for the region, climate, average snow storm, temperatures, and other important factors to make sure a system is going to work well for a particular location. Choosing Warmzone, then, is a great way to get the best possible radiant heated snow melting solution for your home. Maybe an optimized radiant heated driveway is nice, but who’s to say a “one-size-fits-all” approach won’t do the trick? Warmzone is prepared to help you find that “sweet spot”, the system you want, at a price you can afford that exceeds your expectations. Warmzone is one of the largest radiant heat solutions providers in the country and has a huge inventory of snow melting products available to choose from. You get an top performing system that can handle whatever adverse conditions come your way. With every Warmzone purchase, you also get free consultation, complete design services and installation support. Warmzone experts will take a look at your requirements and assess your situation to come up with the best snow melting solution for your driveway, walkways, gutters or roof. They’ll deliver a system with the best performance for your home and budget. And Warmzone will be available during the installation if you need any assistance during the installation process. You’ll also be able to freely access a full online library of installation manuals, articles and other helpful information. When it comes to a snow melting solution for your home, don’t lower your standards. Contact Warmzone at 888.488.9276 for the best possible radiant heat solution. Have you surveyed your existing driveway with the fear that radiant heat is simply not an option? No matter what your circumstances, whether it be your driveway type, budgetary restraints or your project goals, don’t pull the plug on your dream driveway until you speak with the folks at Warmzone. You’ll discover the versatility of radiant heat makes it possible to have the driveway of your dreams. If you’re building your own home, you’ll definitely want to consider a snow melting solution before you pour your driveway. Both electric or hydronic radiant heat systems can be custom designed to meet your specific snow melting needs. The difference between electric and hydronic systems is fairly simple. For electric heat, as you might already suspect, specially designed electric heat cable is installed in the driveway, evenly radiating warmth up to the surface of your driveway to quickly melt ice and snow. Hydronic heat, however, utilizes a boiler and pumps, heating the water and then pumping it through a network of Pex tubing with similar results. A great benefit of radiant heated driveways is that they are fully automated and maintenance free. The systems are regulated by either an aerial or ground-mount snow sensor that detects optimal conditions for snow, including changes in air pressure, moisture and temperature. When conditions warrant, the sensor signals the master control unit that sends power to the heating element to warm the driveway. After the storm, the system shuts off automatically. With both systems, most often the heating element (whether heat cable or Pex tubing) is laid out in a serpentine pattern to cover the area of your driveway, followed by pavers or an asphalt / concrete pour to seal the deal. But if you’re not in the market for a new driveway, and crave the convenience of a radiant heated snow melting system, you’re anything but out of luck. No matter what your situation, Warmzone has a work around for you. Electric radiant heat systems are versatile and durable enough to be installed in virtually any type of driveway you choose. ClearZone heating cable is available off the spool or pre-spaced in mats that can be rolled out to heat a single strip, tire tracks or the entire driveway. Whatever you decide on, both the cable and the mats are durable and able to withstand years of punishment from the weather, as well as vehicle traffic. ClearZone heat cable can even be installed in hot asphalt installations. Driveways can also be retrofitted with radiant heat. Featuring saw-cut technology, grooves in the concrete or asphalt driveway are cut and then cable is placed in the grooves and then a special sealant is placed over the cable. A more common application for heating existing asphalt driveways is to place the heat cable on the old asphalt and then apply a new layer of asphalt over the existing surface. With electric radiant heat systems, there are very few limits to the type of surface and area you heat. They perform well and can be installed on or under a variety of materials, including concrete, asphalt, and stone, brick or tile pavers to deliver consistent performance every time. You’ll also find solutions to fit your budget as well. When it comes to the heated driveway system of your dreams, you may have more options than you think. To learn more about the many options available, or to receive a free quote, call Warmzone today, at 888.488.9276. Being the first to test out an unknown product can be scary, especially if we’ve invested a lot of time and money. Driveway heating technology isn’t new but people often wonder if the radiant snow melting systems are built to last and stand the test of winter over and over again. Year after year homeowners enjoy the benefits of snow melting systems. What has their use over time told us? That heated driveways are meant to last and to improve the value of your home. An electric heated driveway in action. If you are just coming upon the savvy heated driveway scene, you are in luck. The technology has been tested and proven time and again with many happy snow-free customers. Installing a heated driveway system right now is not only a smart move for your property it is also fully automated and hands-free. You can sit inside your warm home, reading a good book with a blanket on your lap and watch with contentment as the snow falls outside, knowing you’ll never have to pick up a shovel. You can reserve your snow clothes for fun outdoor recreation like cross-country skiing or snowmobiling instead of clearing snow from your driveway. With the help of a snow melting system control unit you can install a heated driveway and never worry about it. A wall-mounted control unit uses smart technology to detect precipitation and outside temperatures, thereby turning your system on and off when, and only when, it is needed. The heated driveway system controller is easy-to-use and consists of a timer and digital operator interface with manual override capability. Even the ancient Romans used principals similar to radiant heat and humans have only perfected since then. Driveway heating has been around for a long time and will be around for a long time to come. Given the snow removal laws such as those passed recently in Massachusetts, homeowners are mandated to remove snow and ice from walkways for pedestrians. If the sidewalks are not cleared, property owners are not only susceptible to personal injury lawsuits, but they also face the possibility of fines levied by the local government. Removing snow from driveways and sidewalks is no longer an option – it’s the law. To comply with the city ordinances, many homeowners find the convenience of using salt and other snow melting chemicals preferable to the time consuming, physically exhausting rigors of shoveling or plowing the heavy snow. So, many consumers stock up on salt and other snow melting chemicals prior to the winter months. But the convenience of using snowmelt chemicals comes at a price – a price not reflected in the actual purchase of the salt or chemicals. The adverse environmental effects of these chemicals can be evident year round. While effective in melting snow, salt and chemicals are not so friendly to the surrounding landscape. 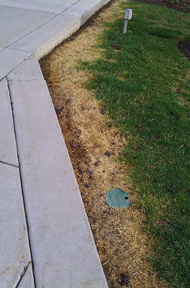 When spring arrives, the bordering grass and shrubs often reveal the ugly scars from the repeated use of snow melting chemicals during the winter, as evidenced in the photo. 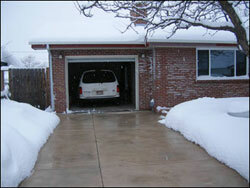 Installing a heated driveway eliminates this problem. The results of using salt to melt snow and ice from a driveway are clearly evident in the spring. For those who are serious about going green in this day and age of environmental awareness, radiant heat snow melting systems have proven to be an ideal solution. The best time to purchase and install a snow melting system is during the early spring. This is a time when homeowners are more interested in outdoor grills and barbecues than snow melting systems, so naturally, the demands for these systems wane. As such, consumers are more likely to discover discounted prices. Of course, once the summer has run its course and Old Man Winter can be seen on the horizon, consumers tend to scramble to install a snow melting system before the first storm hits. While snow melting systems have become more affordable, it is still not a home improvement purchase that should be done on a whim. It pays to do some research and deal with experts who will talk openly with you about the various products available. Don’t be fooled into thinking that there is a ready-made system that is perfect for all your needs. You need unbiased professionals who can design and engineer your custom solution. Warmzone is one of the largest and most experienced radiant heat providers that consults freely with consumers to help them learn the “how’s, what’s and why’s” – before any decisions are made. Warmzone is a trusted, leading provider of radiant heat systems, for good reason. They’ve been around a long time, and offer a wide variety of proven systems from only the most reputable manufacturers. Unlike many providers, Warmzone is not “locked in” to selling one brand or “one size fits all” system. In fact, Warmzone provides customized solutions to meet the snow melting and budget needs of its customers. The professional design team reviews every aspect of the project and also provides installation support, resulting in the complete solution. For those who are serious about the environment and looking for a “green” solution for snow melting, visit Warmzone online or call today, at 888.488.9276. Can a Snow Melting System be Installed Beneath an Existing Driveway? Many people become interested in a snow melting system because of their many winter advantages and then become discouraged thinking they’ve missed the driveway-heating-ship since they’ve already got a driveway. The good news is that you can put those fears aside and still catch the heated driveway wave. Let your fears sail away as you understand that radiant snowmelt systems can be retrofit. Snow melting systems can be installed with minimal effort if you are willing to put up with a little minor construction dust as new radiant heat cables are placed beneath your existing driveway. Having a heated driveway is definitely something you can achieve if you already have a driveway. You can either tear up the old concrete or asphalt if your driveway needs a facelift, or pour new material over the cables that have been designed and laid out by a Warmzone radiant heating expert. Heated driveways are easily customized to fit your exact heating specifications. If you have a long driveway and it seems cost prohibitive to heat the entire thing, consider doing two strips for the tires of your vehicles. Even if you have a driveway that you hand shovel or plow each winter, you are still a valid candidate for driveway heating. New homeowners and construction professionals in cold-climate regions have discovered that radiant heated driveways can’t be beat. It’s easy to understand why as you drive through any new neighborhood in the winter and spot the sleek heated concrete, asphalt or paver heated driveways, completely free of snow and ice. But just what are the primary benefits of radiant heat? Well, if you’re one of those who is considering taking the leap to radiant heat, then consider these ten benefits of radiant snow melting systems. 1. Radiant heated driveways are fully automated. When temperatures are below a certain set point and the snow sensor detect precipitation, the system will be activated. This state-of-the art automated radiant heating system only turns on when needed and shuts off afterwards, keeping your bill affordable. 2. Electric heated driveway systems require no maintenance. This means you can sip your hot cocoa from your window and taunt the schmuck next door who is losing the battle of the blizzard one shovelful at a time. 3. 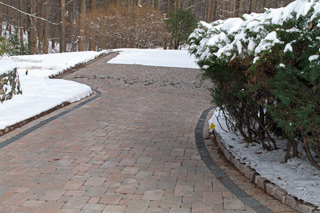 Heated driveways can be easily customized. Got a funky driveway design? No problem. Radiant heated driveways can be designed and installed in any unique driveway, sidewalk, or outdoor application. 5. A radiant heated driveway is an easy, no-frills way for you to go green. Driveway heating systems use renewable energy, which is a big thumbs up from Mother Nature. Additionally, heated driveways eliminate the need for that nasty salt that can wreak havoc on neighboring plants. 6. Durability is a heated driveway’s middle name. The radiant heat cables used are designed to withstand winter’s best attempts to destroy your driveway. Plus, Warmzone snow melting systems come with a 10-year warranty that covers up to twice the cost of the original installation. Yes, heated driveways are built to last, which means you do nothing but sit back and relax with snow-free peace of mind for a lifetime. 7. Electric heated driveway systems are relatively easy to install. With a little help from us and some ambition, you can have your heated driveway up and running in no time. 8. Radiant heated driveways can be installed under virtually any surface, including asphalt, concrete, tile, brick pavers―you name it. Having a snow-free driveway doesn’t mean sacrificing on aesthetics. You can have whatever surface you want just how you want it―delightfully snow- and ice-free. 9. Warmzone radiant snow melting systems feature rapid response times. An electric radiant heated driveway heats up to 30 percent faster than other snowmelt systems, meaning you get better performance fast. What’s more, it produces only 35-50 watts per square foot, getting you more snowmelt for your money. 10. Heated driveway systems enhance safety for you and your family. Consider slipping and falling on snow and ice a fiasco of the past. Even better―you’ll never have to deal with strained backs and blistered hands again. In fact, maybe you can give it to the neighbor. He’ll need it. Whether it’s springtime, summer or fall, plan ahead and install a heated driveway system today to ensure a winter of peace and satisfaction. Once that first snowfall rolls around, you’ll be happy to finally say that your radiant heated driveway is cooler than your neighbor’s snow-laden driveway. As the most durable, versatile and long-lasting radiant heat cable on the market, ClearZone heat cable is the most trusted radiant snowmelt solution available. Combined with Warmzone’s advanced master control unit, the snow melting cable can be installed in virtually any snowmelt application and can even withstand the heat and compression of newly poured asphalt. Warmzone offers the premier heat cable that carries the industry’s most comprehensive warranty. Unlike other heat cable warranties, the cable that Warmzone carries not only provides a 10-year warranty for the cable, but also the labor costs associated with replacing any defective cable. Simply put, Warmzone snow melting cable is unparalleled in all aspects of performance, reliability, longevity and manufacturer support. 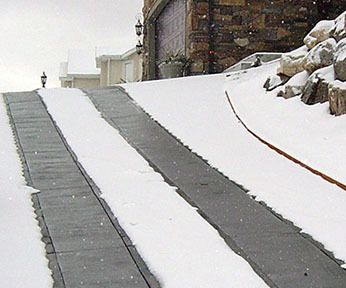 Electric heated driveway systems utilize a small wall-mounted control unit to power the snow melting system. The master controllers include line and load terminal blocks and operating contactors. The snowmelt system controller features a built-in, easy-to-use programmable timer and digital operator interface with manual override capability. The unit is compact, durable and efficient, further complementing the overall performance of the ClearZone snowmelt system. Using readings from temperature and moisture sensors, the controller ensures economical control of power consumption when keeping outdoor areas free of ice and snow. A moisture sensor is installed in the surface of the driveway. As soon as moisture is detected, the controller activates the snow melting system. Once the sensor has dried out, the thermostat immediately switches off the heating system. Warmzone radiant snowmelt systems come standard with an aerial-mounted snow sensor. 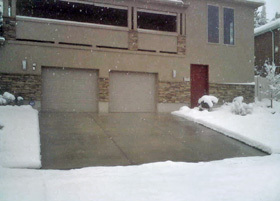 This highly sophisticated, yet durable device automatically activates the driveway snowmelt system when certain conditions are met, and has several notable features, including: adjustable temperature trigger point, adjustable delay off cycle, upgrade-able remote activation, and it is smart-system compatible. Pavement-mounted snow sensors are also available, but are more commonly used in commercial applications. These devices allow the radiant snow melting system to be 100 percent automated, activating only when it snows. Manual mode allows you to activate the system in case the wind blows snow on the driveway or ice forms due to wind or shade. Salt Lake City, Utah – March 2, 2012 – Warmzone, a leading provider of radiant heat solutions has announced that it is moving its corporate headquarters from downtown Salt Lake City to a much larger facility in Draper, Utah on March 5, 2012. Located just 18 miles south of the old Warmzone headquarters, the new facility boasts greater office space and increased warehouse capabilities. In spite of the sluggish economy and recent economic challenges, Warmzone has continued to experience growth, necessitating the move into a larger building. The new facility will allow Warmzone to significantly increase the amount of inventory it has in its Utah facility, which will ultimately translate into even quicker service for Warmzone customers. In addition to Warmzone’s preeminent customer services, the company offers a wide variety of proven radiant heating solutions. This allows Warmzone to offer the ideal solution for the unique needs of each customer. Every project is carefully evaluated and designed prior to any installation. Given the wide product offering and renowned customer services, Warmzone’s growth seems a natural progression. Seriously consider a life without back breaking snow removal. Can you picture it? Are you smiling? Well, having a radiant snow melting system right outside your front door makes that snow-removal-less life possible. If you put a heated driveway to work for you, chances are you’ll enjoy winter a whole lot more. It doesn’t take much effort or upfront cost to make a radiant heated driveway possible either. 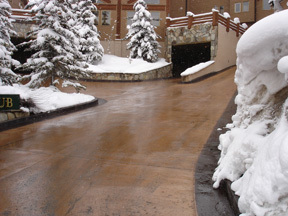 Radiant snow melting systems are a simple addition to any new driveway as they can be installed before the concrete, pavers or asphalt goes down. But if you have an existing driveway you don’t need to lose heart because heated driveways can also be retrofitted in your current asphalt or concrete driveway. Radiant heated driveways eliminate the back breaking, hand shoveling, sweating work of manual snow removal. Heated driveway systems are fully automated, so feel free to sleep in or enjoy your morning coffee from the warmth of your living room. When temperatures are below a set point (usually 39°F) and the snow sensor (pictured right⇒) detects moisture, it signals the controller which then sends power to the heat cables, outputting a steady stream of warmth to keep your driveway clear of snow and ice. Once the snow flakes hit the warmed surface they don’t have a chance to accumulate as they melt on impact, leaving you with a heated driveway constantly clear of snow. The snow is left to accumulate where it is more appreciated, like your front yard (for optimal snowball fights and snowman building) or even your next door neighbor’s driveway. If you’ve told your neighbors about your heated driveway and they still haven’t installed a radiant snow melting system of their own, you have every right to silently snicker at them as you watch from the warmth of your front window as they huff and puff to remove their snow by hand. If you make a heated driveway work for you, your snow removal days are over. Forever. As radiant heated floors have gained new popularity, so too have heated driveways and radiant snow melting systems. Homeowners are discovering the advantages of automated snow melting systems and ditching their snow shovels and bags of salt. And businesses are getting in on the act too. Radiant snow melting systems have proven to be invaluable for ramps, loading docks and pedestrian walkways. Employees can focus on their jobs instead of taking time out to shovel snow during the winter months, and liability for slips and falls on icy sidewalks is greatly diminished. The increased safety and productivity far outweigh the costs, as businesses continue to seek out radiant heat snow melting solutions. 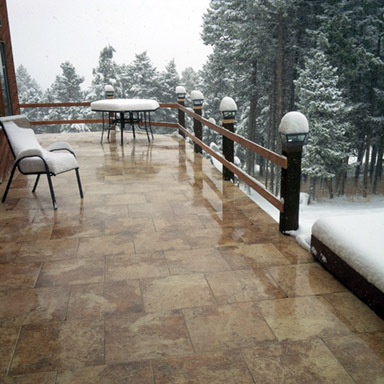 Home settings like steps, patios or sidewalks that lead to a hot tub are popular applications for snow melting systems. Hydronic or electric snow melting systems can be installed for both heated sidewalks/driveways or heated floors. While radiant snow melting systems are typically installed in new construction applications, radiant heat can also be installed in existing driveways and sidewalks. Using saw-cut technology, grooves can be cut into concrete or asphalt surfaces and heat cable can then be placed in the grooves. An epoxy topcoat is then applied to seal the heat cable in the grooves. A sand broadcast can be applied to the surface before the epoxy cures if you want additional traction and safety. Radiant snow melting systems can be customized and installed in countless numbers of snow melting applications. Call a Warmzone radiant heat expert to learn more today, 888.488.9276. What’s not to Love About a Heated Driveway? Seriously people, what’s not to love about having a heated driveway leading to your domicile? You literally say goodbye to back breaking snow removal after ever single snow storm for the rest of your life. You should love your radiant heated driveway for that perk alone, but it does so much more. Having a heated driveway allows you to stash your snow shovel, snow blower, salt and deicing products. No more harsh chemicals to keep the ice away since your radiant heated driveway will do that for you. So in a round about way it even helps keep the environment clean, by avoiding cruel environmentally toxic products. Most of us may associate a radiant snow melting system with a heated driveway. Why not apply the same smart technology that comes in a snowmelt system, to a sidewalk? Pedestrian safety is key when running a business or taking care of public buildings such as schools or libraries. Using a radiant snow melting system underneath a sidewalk would be a significant perk to any existing or new project where pedestrian traffic is being taken into account. Having walks clear of snow at all times would increase traffic and safety. Radiant snow melting systems are relatively affordable and save you in the long run when it comes to snow removal cost and headaches. The fully automated snow melting systems are simple to maintain because they require no human intervention. They do however come with a manual override should you ever need to melt a snow drift that collected on your driveway or ice that formed in some shade. The Snow. The Heated Driveway. The Melting. Every day it snows millions of us curse its accumulation. We point our fist to the sky, shaking it with fury and scream WHY? ENOUGH ALREADY! MAKE IT STOP!!! It’s not that we don’t enjoy the beauty of snow or the extremely fun winter sports that it allows, it’s just that, well, we’re sick to death of shoveling, snow plowing, slipping, sliding, falling, and wishing it would just melt on its own. The oversimplification of snow removal is possible. First you get the snow, then the heated driveway , and then oh heavenly day, the melting. Once a radiant heated driveway is installed the hard work is over. It does sound simple. Maybe a little too simple, but the beauty of it is that it’s real and exists. A heated driveway takes the once burdensome snow and makes it pretty again. You can sit back and watch it fall without a single curse word uttered or fist shaking. A radiant heated driveway does all the work for you.